Can I adjust webcam live video color? 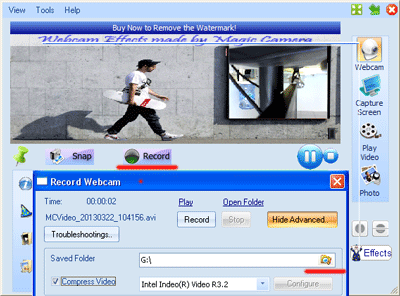 How big are files created by Webcam Recorder. When I record from some webcams all I get is a black or blank video. Can I record to an AVI file with WebCam Recorder. What is the upgrade policy and will the license last forever? How long will it take to get your supporting answers? Q.Can I adjust webcam live video color? When you adjust the color settings and effects of your recording video online, the results can be seen immediately in the main window and captured when you hit record. Adjusting the brightness, contrast ,sharpness,white balance,saturation and gamma is perfect for lesser quality cameras whose image quality is not quite right. Q. How big are the files created by Webcam Capture Studio. The file size will depend on the setting you use to webcam recording, such as the screen area/size, the codec used and the frame rate. We strongly recommend you experience with the trial version. Q. When I record online videos from some webcams all I get is a black or blank video. A. This is a problem caused by the way some webcams inconnect with your video card. Right click on a blank area of desktop and select properties. Head to the Settings page and click Advanced. Go to the troubleshootings section and you'll see a slider for hardware acceleration. Slide this as far to the left as it will go. A. Yes, of course. The webcam videos will be recorded to an AVI file and save automatically in C:video. Q. How can I change the location of video files? A.1) Click the Webcam Capture Studio icon. 2) Click the record button, then appear a new interface. 3) Click on the button with folders icon and select where you place your video. Now you can change the location of the video files. Q. What is the upgrade policy and will the license last forever for Webcam Capture Studio? A. Generally, there is no time limit for the license, so far we have offered free grade for all our products. Q. Are there any differentce compare with other webcam recorder programs? A. Yes, Webcam Recording software allows you to add various effects such as Animation, Distortions, Filters, Scenes, Frames effects, etc, and also enable you to draw pictures on your webcam video during recording progress. Q. How long will it take to get your supporting answers? A.Generally speaking, you'll get our feedback within 24 hours except for weekends or holidays due to the time difference.